Spring has finally arrived and I am so happy! I love the bright cheerful colors and warmer weather that spring brings our way. Speaking of bright and cheerful, please take a moment to look at all of the flyers our clubs and councils submit each month. I am continually impressed with the variety of dance themes and great flyers our clubs and councils post. They are all unique and creative and do a great job representing your clubs and your dances. During our last state meeting, Dave and Patty Cooper introduced us to a new Oregon Ambassador, Rocky Yellow Rocker. Rocky is a small traveling rocking horse who would like to travel around the state of Oregon attending all of your special dances. However, he needs your help to travel. It appears his last visitation was to the Charlie Brown’s graduation. If you would like Rocky to visit you, please check out his Rocky Yellow Rocker Facebook page and arrange with the last club he visited how he can travel to you. Remember to post pictures. Rocky is very photogenic and likes to see pictures of himself with all of his new friends. By this time, most of our clubs and councils have held elections. Congratulations to the new officers. Thank you to everyone who volunteered to run for an office. Clubs if you have already mailed your OFSRDC ballots to the OFSRDC secretary Tim Hagey, thank you. If you haven’t mailed your ballots please be sure to mail it as soon as possible so they can be counted during our state meeting on April 29. Spring is in the air, and it feels like the days are getting a bit warmer. 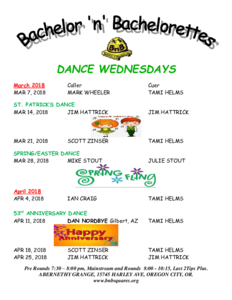 Lots of special dances are going on this month. Your hard-working Federation board will be meeting in Port Orford at the end of the month to conduct Federation business and count the ballots for our 2018-19 slate of officers. 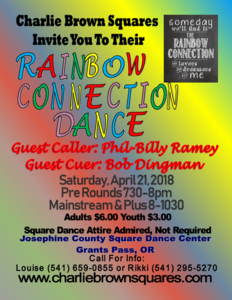 Click here to find out how to get your information into the OFN, including dances, lessons, photos, flyers, advertisements, and caller/cuer information. The Federation's next executive board meeting will be on April 29 at the Beachcomber's Hall in Port Orford. Oregon's 2018 Summer Festival will be held at the Josephine County Fairgrounds in Grants Pass on June 22-24, 2018. Watch here for more details. Download your registration form here. Start planning for Mid-Winter Festival 2019, January 25, 26 and 27, 2019. The 67th National Square Dance Convention® will be held in Kansas City, Missouri, June 27-30, 2018. USAWest 2018 will be held in Reno, Nevada, August 16-18, 2018. Download a complete list of the Federation club dances this month, all sorted by date and city. Everything in the When & Where is extracted from the state directory information. If you find that your club information is wrong, you can fix that by going to the directory information area and fixing your data. Click on the title to see the article. Helen Hanson passed away peacefully in her sleep on 2/19/2018 at the age of 95. Dancing was one of her favorite recreational activities, square and round dancing in particular. 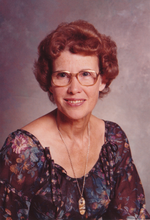 In the 1960’s she took classes in square dancing at Mt Hood Community College and Portland State College. The school district where she taught elementary classes said they might have to cut Physical Education funding. She thought square dance was something she could teach if she had to provide a P.E. program. The children enjoyed the activity, and ,using records, her class square danced regularly. Previously known as Helen Gross, she has been twice widowed. She danced with friend and partner Jody Glass over 10 years until he passed away. She learned to cue the rounds from Mary Ann Rother and Dan Sabola, and substituted as cuer for many clubs in the Portland and Vancouver area. She taught round to groups and individuals. She met Harold, her future husband in a lesson situation. Helen fondly remembered the old former square dance hall in Portland owned by Stella and Jesse Tufts. Helen and Harold were married in that hall with a fun square dance wedding. Harold celebrated his 80th birthday with a special dance in that hall. The tufts have been long gone now and so has the hall. Harold passed away in 2007. Helen and Harold were both Mazama Mountaineers and had been hiking and climbing for years. After they were married they took out hiking and treking expeditions all over the world. They led over 18 international outings. They went to the worlds most southern square dance at the tip of Tazmania Island off the southern coast of Australia. They were the only Americans to ever have attended that dance, at the time. 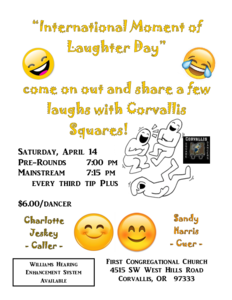 In Portland they enjoyed dancing with the B&Bs, River Gate Stompers, Checkerboard Squares, Mix and Mingles, Eager Beavers, Happy Hoppers, Oaky Doaks, and others. 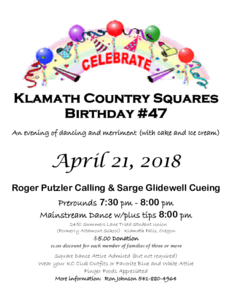 On June 16, 1985, Helen (then Gross) , and Genevieve Churchill put on the one and only square dance at Crown Point in the Columbia Gorge. The highway department said “never again”! After 20 squares had formed the area became so jammed with dancers that regular traffic could not get through. Police were called to limit participants and reroute parking to the women’s forum parking lot a mile away. They also provided shuttles back and forth to that lot. It was a great dance, in a great place, with a great crowd attending… Too Great! Helen treasured all the memories of dances big and small. From the time she cued at the 43rd National Square Dance Convention in June 1994 to local mid state festivals. A special thank you from Helen goes to Jim Hattrick, Lois and Gene Noble, Craig Abercrombie, and Jeanine Norden for the good times enjoyed at their dances. When the music plays, the callers and cuers call. When friends dance together those are Happy Times!! 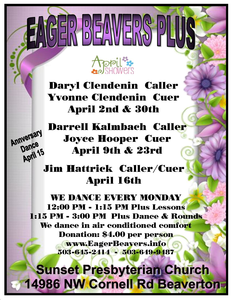 You can download this list of callers and cuers who are available and ready to call or cue a dance for you. 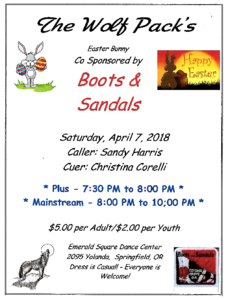 April's Oregon Round of the Month is "Cincinnati Fireball", by Johnny Burnette, Phase II Two-Step, choreographed by Carl and Carol Schappcher. This was chosen by Mid-Willamette Area Council. Download your cue sheet here. For more information on the Round of the Month, please contact . Everything in this section is taken from the state directory information. If you find that your class information is wrong, you can fix that by going to the directory information area and picking to the "Lessons" tab. Three days of dancing with the Ramblers! Click a thumbnail to download the flyer. Please support our advertisers, since they help support the magazine. Click a thumbnail to see the full advertisement. Click a thumbnail to see the full-sized picture. Click a council name to go directly to that section. Our next scheduled dances are June 30, September 29 and December 29. We'll have to decide whether or not we';ll actually have a dance December 29 since New Year's Eve is just a couple of days later. Our current board is President - Linda Putzler, Vice-President - Sandy Harris, Secretary - Christina Corelli, Treasurer - Gail Jackson All all woman board. The next time you read our OFN blurb we should have a new board to present to you. Hopefully, at our March 31 meeting we'll have other members willing to take on an office. 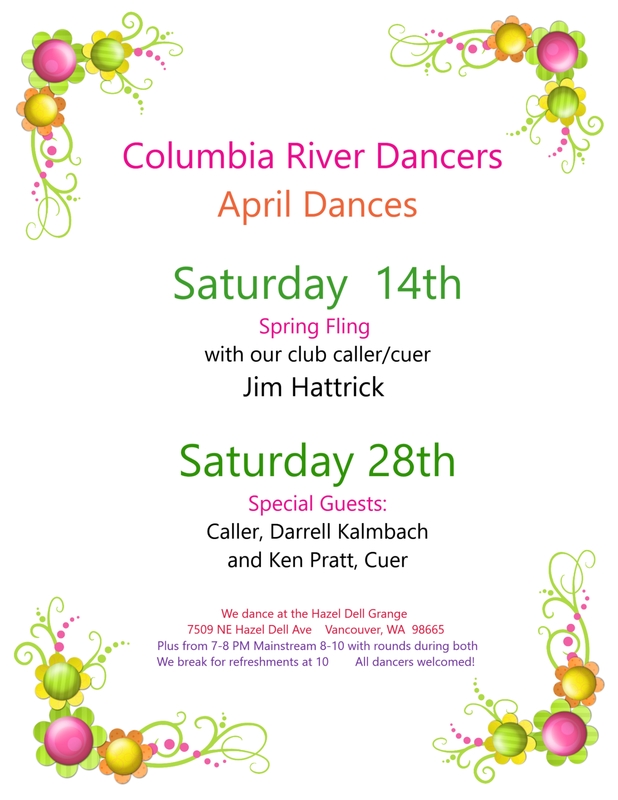 We do have fairly new callers and cuers who have joined CCCA and call and or cue at our Fifth Saturday dances. We have a CCCA meeting prior to the dance. 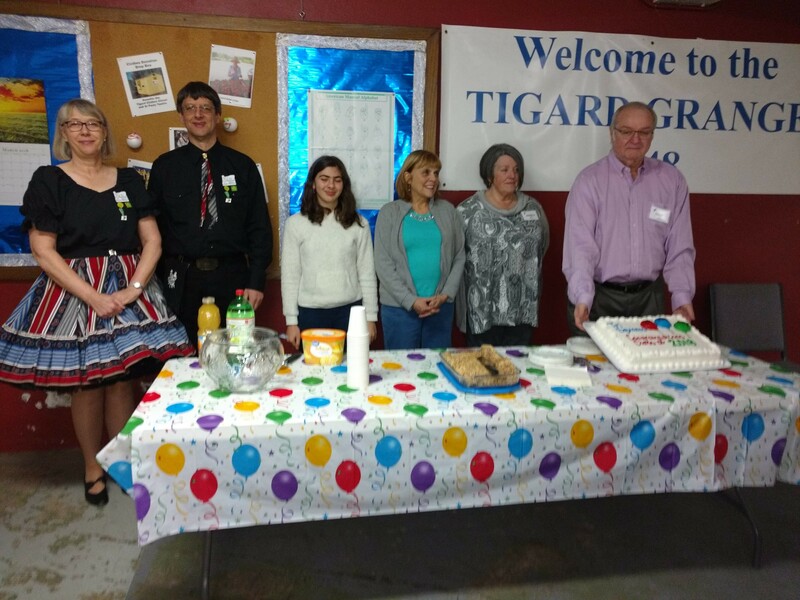 February 9th we celebrated our 54th birthday with a wonderful visitation by the Independence Wagon Wheelers who brought along their caller George Hermann and his wife Patty. This visitation of 17 strong really added to the fun. We were perplexed when we could not find their banner to return to them. They took home one of our instead. Jim Hattrick, George Hermann, Mark Wheeler, Patty Hermann and Jackie Gale called and cued a great dance for us . There was plenty of birthday cake for all. We shall have to plan a visitation up to Rickreal to retrieve our banner soon. 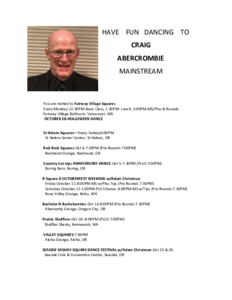 On February 23 we held our 4th Friday dance with Craig Abercrombie calling and Jackie cueing. While we had a very small turnout, Craig really poured it on and made the dancing challenging and great fun. As always he chose just the kind of music we could all enjoy—giving us a choice at one point between Michael Jackson and Lady Gaga. That night at a special meeting during the break we voted for officers and delegates for the 2018-19 year. Larry Reetz will remain as president, but we now have Don Schimonitz stepping into the Vice President’s shoes. Thanks to both and all the others willing to step forward and keep our club running smoothly. 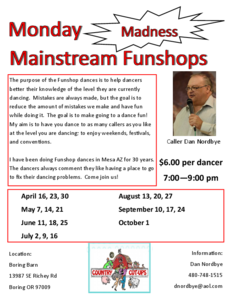 We are looking forward to fun club dances in April including the special dance to be held on Tuesday April 10 with Dan Nordbye calling. We’ll be seeing more of Dan as he has now moved to Portland. 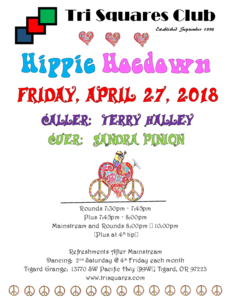 Jim Hattrick will be calling our second Friday dance and Jim Voll our 4th Friday. Please come and join us. Snowbirds will be back, and we hope the flu season will have abated. We continue to dance Sunday nights from 5:30 - 8:00 at all levels with our competent caller and teacher, Tim Matteson. We encourage dancers to come dance with us and get more floor time. 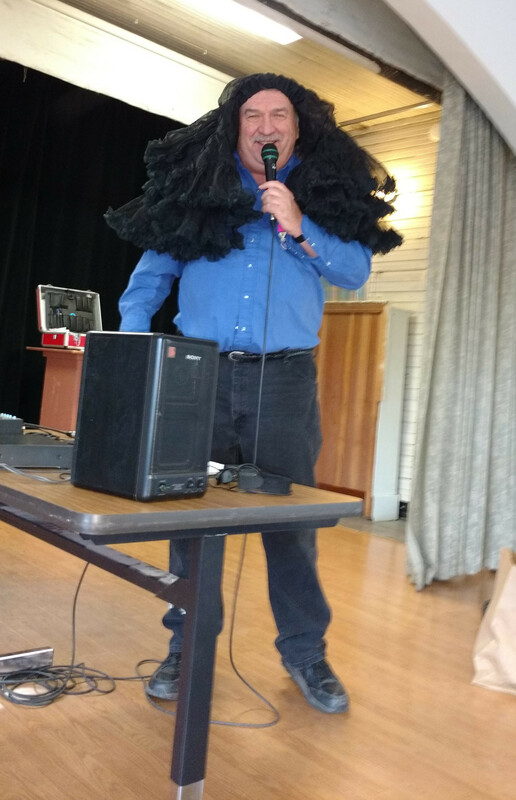 Please call our president, David Lajoie at 541-520-7311 or Tim at 541-988-0399 to make sure we are dancing as we go dark once in a blue moon. We don't want to miss you. Our dances/classes are always casual. We always have a lot of food too. Come for a fun evening almost every Sunday! 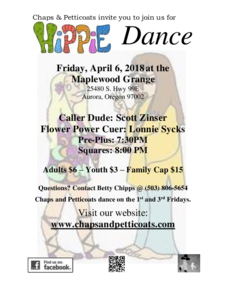 April 10 is the annual Dan Nordbye dance. Dan is a national caller out of Mesa, Arizona. Pre-Rounds with Christina Corelli is scheduled for 7:30. Dan will call mainstream with every third tip plus from 8:00 - 10:30. $7 Dancers may bring cookies if they desire. Dan's program is unique and a heck of a lot of fun! Please join us April 10, a Tuesday for a FUN evening! We have a special dance May 12 with details coming later. This dance is a Saturday. We will be dark the following day, Sunday, May 13. We'll be in Hall A for this dance with a special caller. We are dark April 1. We are so blessed to have national caller, Kris Jensen, call for us a number of times during the year. Kris and Kurt's mom now lives in Eugene (formerly Medford). Lucky us dancers! And thank you Kris! Our caller, Tim Matteson, gets a chance to dance. We had a fun Valentine’s Day dance with guest caller Bruce Lowther. Our new dancers came and we had guests as well. Several accepted the challenge to bring their wedding photos and it was really interesting! What a great idea! 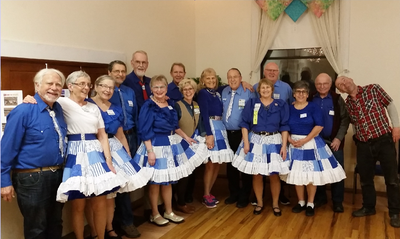 We have two new club members, who joined after finishing mainstream lessons, and we're enjoying their enthusiasm for the fun activity and camaraderie that square dancing brings. New members add to the energy of the club! The outstanding 2017-2018 IWW Mainstream Class graduated on February 18. Many of them have already been to their first Mid-Winter Festival, and we look forward to their contribution to the square dance community. Congratulations graduates! Also, many thanks to the angels who added so much to the students’ learning experience. 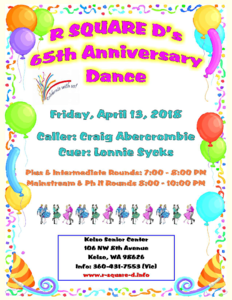 As we compose this newsletter, we are looking forward to our March 10 Birthday Dance, celebrating 58 years. 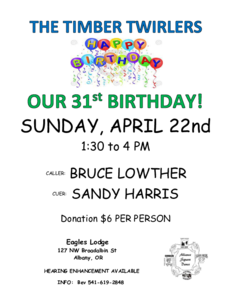 We hope that many of you will have joined us to help us celebrate. The club completed Waltz and started Jive lessons on March 15. The waltz class was mainly refreshing waltz steps the last two weeks before we switched over to the Jive lessons. We are dancing to make sure we know what we learned and maybe work on a step that shows some difficulty. Cheryl has given us some dates when she will be gone and our Vice President is working on getting another cuer to take over those nights. 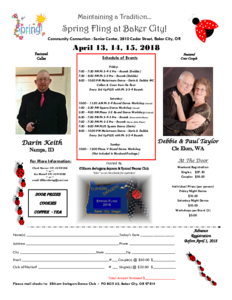 We will be checking with Jeanine Norden and Ken Pratt to serve as our guest cuers and we look forward to having them come and grace our stage. Always fun to have them around. Thank you to everyone who came to our youth fundraiser dance. There were over three squares at the dance and we had a great time dancing to Leonard and Judy. We raised over $1,000 for the competition. Our cash raffle winners were Izzy Bickle, Georganne Pfinster and the boss of one of our club members. Mom (Karyn Buchheit) is definitely looking for volunteers to help out at competition - there are a lot of jobs that need to be covered and there are not very many of the previous volunteers coming down from Canada and Washington just to volunteer. She also asked me to let people know that if you are volunteering on Saturday morning, you are provided lunch and if you are volunteering on Saturday afternoon, you are provided dinner. Please call mom at 503-873-5241 or to sign up to volunteer by emailing her at buchheitfarmkm@gmail.com. Please don't assume that mom remembers that you talked to her previously and said that you would do something or that one of us kids gave her your information. She is neck deep in festival registrations and paperwork. We have had an added difficulty with our competition practices this year. Not only do several members of our teams have jobs and college/high school, we also have a few who can only make one of the two practices a week AND we have had chicken pox going through our teams. Three of our team members have had it and we are hoping that we are through (nobody else has come down with it for a little over a week - one more week to go to know for sure). See you at a dance soon!!!! In February a series of new round dance lessons began, consisting of the waltz and hosted by Willamette Squares at the Salem Square Dance Center. There will be no further square dance lessons until next fall. 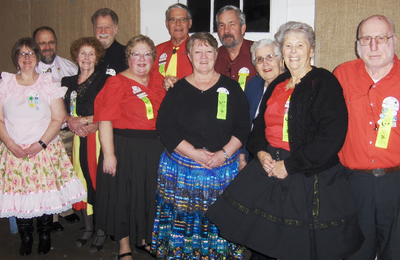 Willamette Squares always enjoy their regular dances on the fourth Saturday at the Salem Square Dance Center. You can count on a variety of food choices and lively camaraderie. You might want to consider wearing a bit of green for our March dance. We’ve picked up some new members this past year, in spite of the fact that I tell people I wouldn’t join a club that would have someone like me as a member! 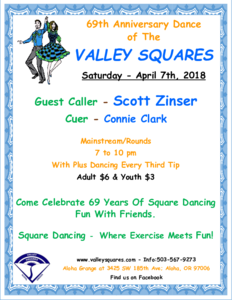 Come for a great night out on Apr 11 as we host our 53 Anniversary dance. 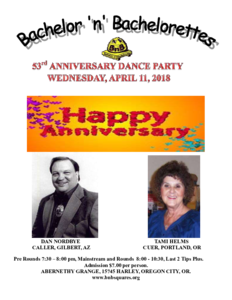 We’ll have Dan Nordbye from Arizona and Tami Helms cueing, as we do every anniversary. Hope to see you there. Decoration Chairman, Dorcus Decor, promises to make this one beautiful dance. Kitchen committee Cal Amari and Brent Burntwell will be making us some unforgettable treats. Our March election results are in. Several officers are returning this year: Secretary Linda and Charlie Phillips, Treasurer Debbi and Dan Ragland, Publicity Ron Rasmussen, 2nd Vice President Robert and Young Lumsden, and President Marc and Bev De La Bruere. We elected a new 1st Vice President to begin in May, Patti Smith. Welcome aboard, Patti! A big thanks goes to our outgoing 1st Vice President Tom and Katie Cassatt who have served faithfully for five years. The Boring Barn is a busy place but our Barn Sale is one of the busiest times of the year! 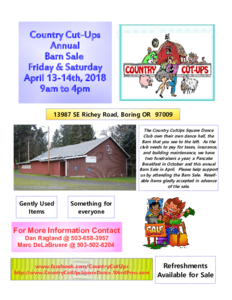 Come on out for our Annual Barn Sale fundraiser on April 13th and 14th this year. You can shop from 9:00 AM until 4:00 PM on Friday and Saturday. You are sure to find something you can use! 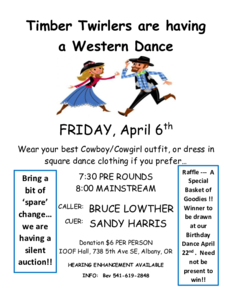 We really appreciate how the square dance community supports this club at our fundraisers. Plus lessons will be going on with Scott Zinser teaching from March 15th through May 31st, on Thursday evenings from 7:30 to 9:30 PM. Come be an angel for our class, if your plus skills are sufficient, or a student if you need to brush up your skills. On Monday evenings, starting in April, Dan Nordbye will be doing some Mainstream Funshops. Come out and check it out! Dan is a first class caller. Be sure to sign up for our May Mystery bus trip scheduled for May 12, 2018. I’d let you know where we are going, but nobody has let the cat out of the bag, yet. It is sure to be fun and full of surprises! $35 will get you a seat on the bus, snacks, supper, and presumably a dance somewhere. 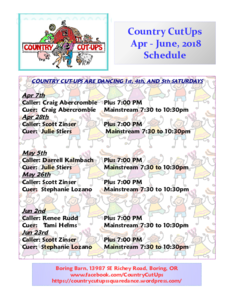 The Country Cut-Ups are a fun club to dance with so come out and join us for dances on the 1st, 4th, and 5th Saturdays. Mary Jane and her gang have been doing a bang up job on the decorations and our food is always great. The traffic is not too bad, so grab you dancing shoes and a partner and head our way! Question: What happens when our Happy Hopper caller is out of town? Answer: We get to enjoy the calling and cueing of a guest caller and cuer. Jim Hattrick will not be with us at our April 7th dance. 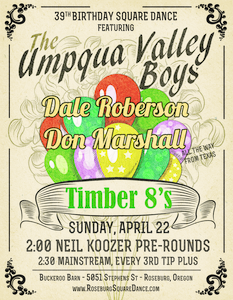 Instead, we are pleased to have Darrell Kalmbach calling and Susan Healea cueing. Both Darrell and Susan do a terrific job, and we are excited to have the opportunity to dance to them at our wonderful hall. It will certainly be a great evening of dancing. Question: Does everyone like ice cream? Answer: Definitely yes! What a great opportunity is coming! 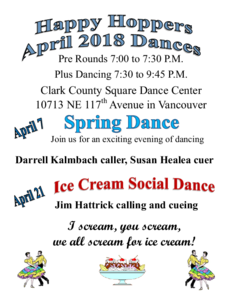 Our April 21st dance will be our annual ice cream social. In addition to the outstanding calling and cueing of Jim Hattrick, we will have ice cream and lots of toppings so guests and members can build their own gigantic sundae. It’s always amazing to see the combinations our ice cream connoisseurs can devise. Of course, then there are the less complex servings made with good old vanilla ice cream and hot fudge—yum! April is also the month when we finish our lesson schedule. While we have not had the usual high number of students this year, we have enjoyed getting to know and angel a number of beginner and plus pupils. The hope is, of course, that they will continue their interest in square dancing and encourage their friends to join our classes when we resume them again in the fall. We are really looking forward to May when we “Swing into Spring” and celebrate our 59th anniversary at our May 5th dance. 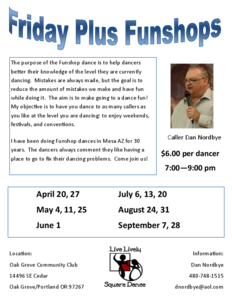 Although we are a plus club, our anniversary dance follows a two mainstream and one plus tip format so that our students who are finishing mainstream class can enjoy time with club members. 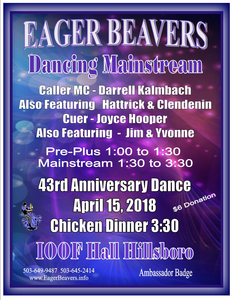 Therefore, anyone who is a dancer can attend and enjoy the great food, decorations, and Jim Hattrick’s calling and cueing. So, mark your calendars and come “Swing into Spring” as we celebrate this milestone in our club’s history. 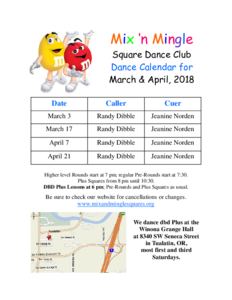 All the cold winter weather did not keep us from kicking up our heels and having fun on the square dance floor in February and March. 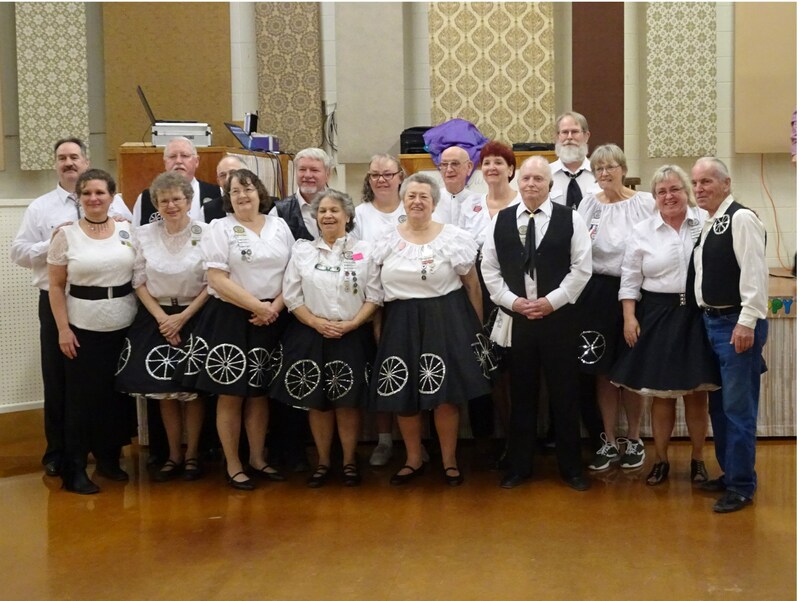 Ian Craig was our guest caller for our first dance in March on March 10 and our second dance on March 17 was our fabulous fifties dance complete with saddle shoes , poodle skirts and bobby socks for girls and the guys dressed as “ cool dudes “. Our annual fifties dance is always a lot of fun. Our own Darrell Kalmbach was calling. 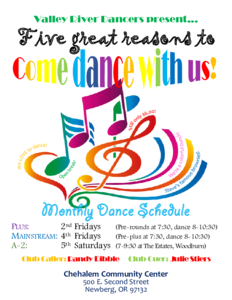 We are trying something new for the month of April regarding our dance schedule. We will be starting with plus from 7-7:30 PM with pre-rounds in between the tips. We will have Mainstream from 7:30. - 9:30 with a short and simple break at 9:30. The dance will end after the break. This is an experiment to see if our dancers and members like this schedule. We will vote on whether to adopt this as our regular schedule at our May club meeting. Meanwhile this is just for April until further notice so stay tuned. We are also out visiting other clubs and welcome all dancers to come visit us. 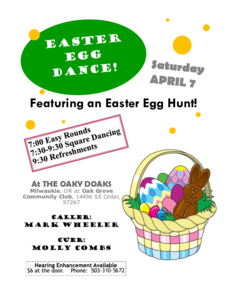 We dance all year every second and third Saturday at Milwaukie Community Center at 42 Nd and Jackson in Milwaukie. 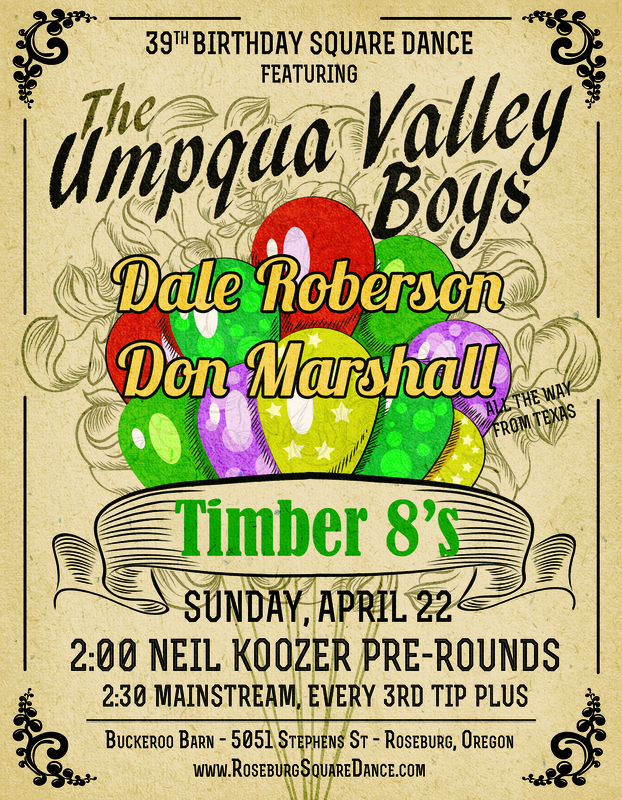 Darrell Kalmbach is our caller and Tami Helms is our cure. We love visitors. 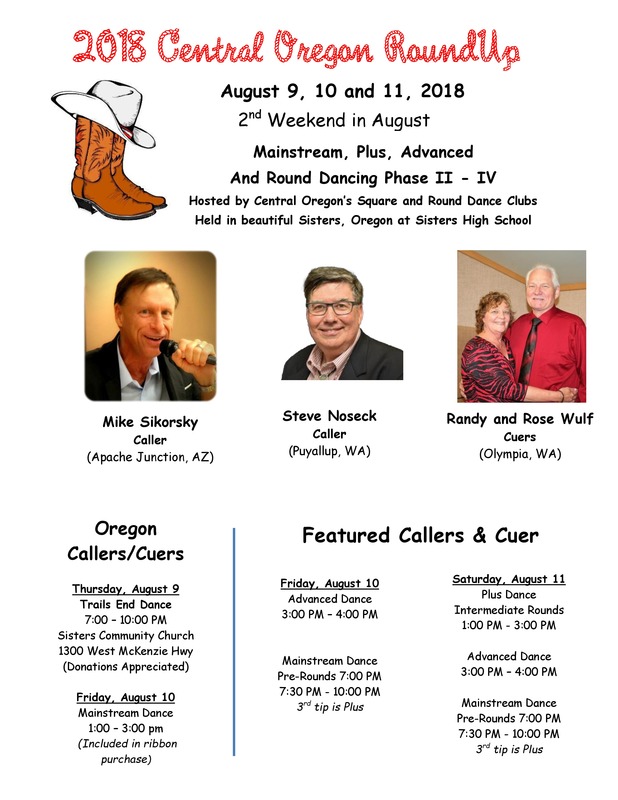 The TVC is about to become the largest Council of square dance clubs in the State of Oregon. The Tualatin Valley Council has accepted a petition from the Valley River Dancers to become members of the Council. Upon receipt of their Constitution and By-Laws and other requirements that may need to be met, the Valley River Dancers will become the thirteenth member of the TVC. The May issue of the OFN will have the first club report from the VRD. Welcome to the TVC. Since the OFN is published mid month, you still have time to plan on the TVC Spring Fling Dance, on the 5th Saturday, March 31st. It will be held at the Kinton Grange, 19015 SW Scholls Ferry Rd, Beaverton, OR 97007. 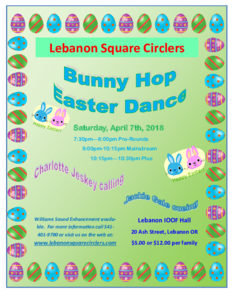 This dance will feature Janienne Alexander calling with Mark McDonald cueing. The dance begins with pre-rounds at 7:30 followed by Mainstream with rounds at 8:00. Every third tip will be Plus. 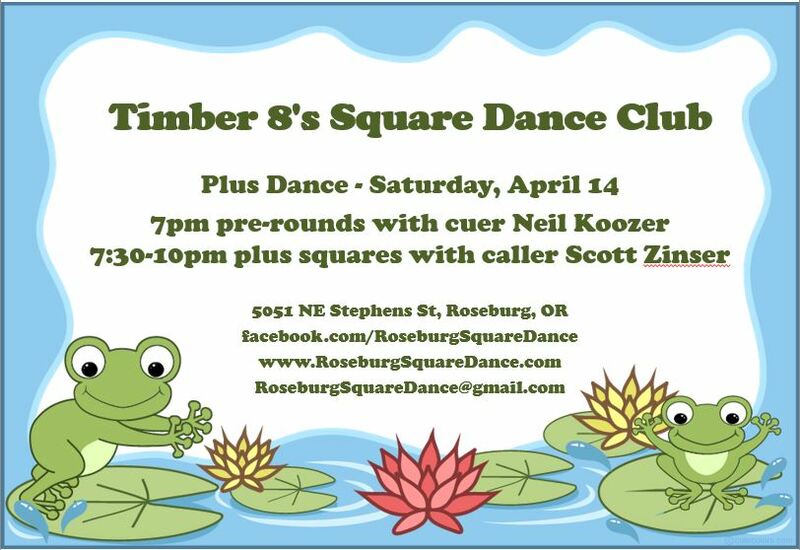 This dance is hosted by the Tualatin Timber Squares. You have heard the old adage that time flies when you're having fun? Well, who would have believed that we passed the three-year mark last month, having fun the entire time? While square dancing seems to be on a slight decline around the nation, we continue to believe it is worth striving to be a club that provides a fun and friendly place to dance and make good friends. We continue to have a beginning class starting the first Tuesday of each month. Jim Hattrick, who will be calling on the 14th, is our teacher extraordinaire. 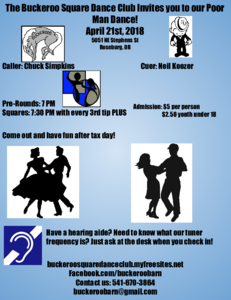 Our annual meeting is set for the 24th of March, prior to our second dance of the month. We will be providing pizza and soft drinks to members. So, here is a good deal; join our club, get a really cool looking badge, and have a slice or two of pizza while enjoying the friendliest people around. For members, this is a reminder that dues need to be paid soon as the insurance has to go to the state office ASAP. Our dues help defray the cost of decorations and supplies for our dance and lessons. The cost is $15 if you need insurance or $9 if you paid insurance at another club. Square dance insurance is required for all club members. You only have to pay for insurance once no matter how many clubs you join. 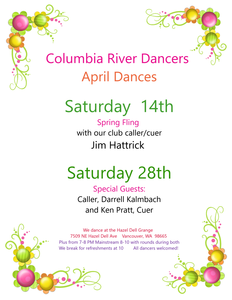 Our Second dance in April will be to with Darrell Kalmbach calling and Ken Pratt cueing. Darrell always has a call or two that keeps all dancers on their toes and keeps the party fun. We always look forward to his coming to us. Just a reminder that we dance plus from 7 to 8 and mainstream from 8 to 10 or so. Our club is known for making sure everyone gets to dance, so singles are welcome. See you in a square. Did you know that it takes 32 beats to do a Grand Square, not 28 as some people may think. Can it be Spring already? I am still eating Valentine candy and I have not taken down the lights on the roof. My lawn is a hayfield. Help! 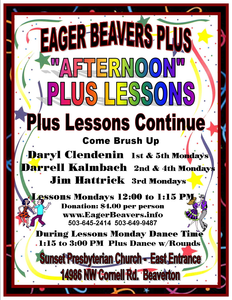 At noon, February 5th, we started our ever popular Plus Classes. By May you will see new plus dancers coming to your club. Welcome them; remember you were once a newbie too. If you are a new dancer do not give up. I had to take mainstream twice to feel like I knew what I was doing and I still make mistakes with plus. Our King and Queen of Hearts were Lane Clem and Sally Duyck. They each received a box of chocolates and the honor of planning the dance next year. Lane Clem is one of our newest callers and has started a small MS class in Oak Hills. He also has been working at Beaverton Lodge with people in walkers so they can enjoy square dancing too. I need to see how he does this. I guess if people can dance on horses they can find a way. We had nineteen Eager Beavers visit the Hoedowners for their Anniversary Dance and chicken dinner. We visited with friends from other clubs although sometimes we did get a little too noisy during the round dances. Thanks to the Hoedowners for a really good time and an excellent chicken dinner. 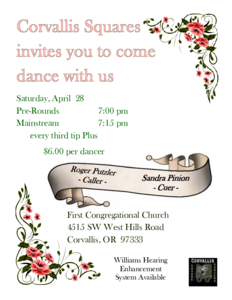 April 15th is our Anniversary Dance and all are invited to come celebrate with us. We will be dancing Mainstream with a half hour Pre Plus. Come get your ambassador form signed. 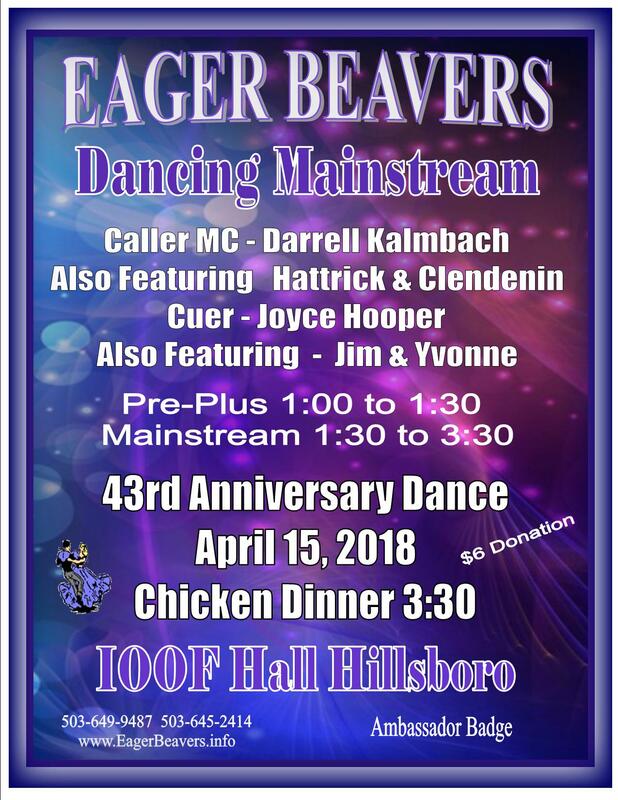 Dancing starts at 1:00 and Chicken dinner is served at 3:30 PM. Come to Hillsboro’s IOOF Hall second floor and if necessary there is a slow elevator. 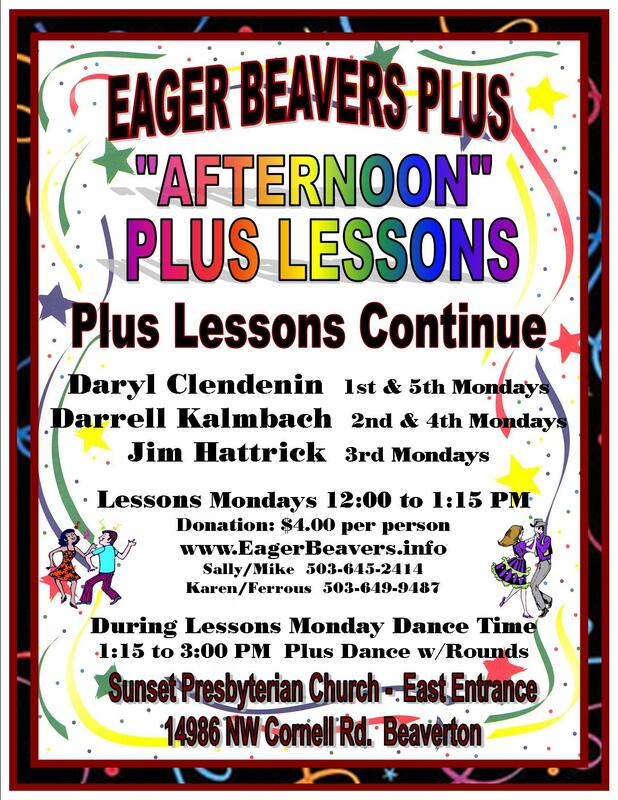 All plus dancers are invited to dance with us on Monday afternoons, 1:15 to 3:00 pm, at the Sunset Presbyterian Church, 14986 NW Cornell Road in Beaverton. 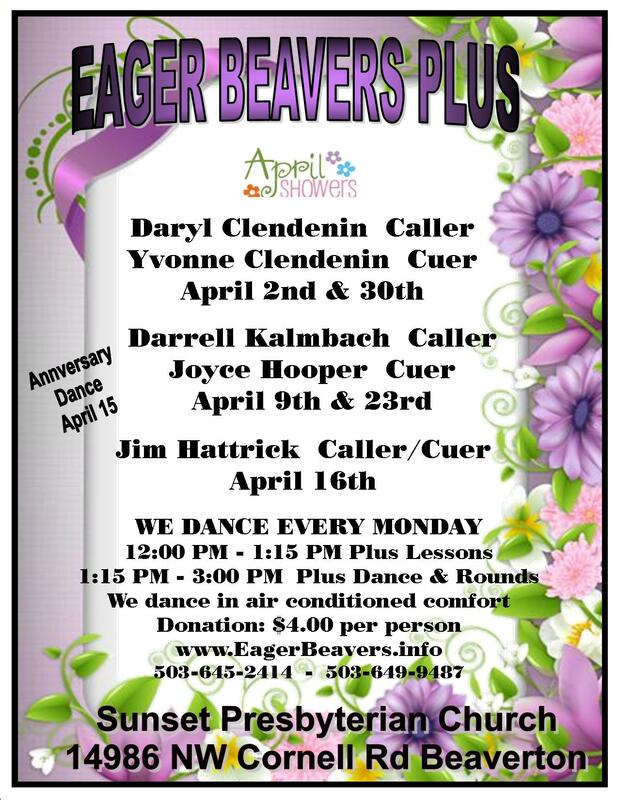 Please check for up to date information at www.eagerbeavers.info or OFN website: http://ofn.club. 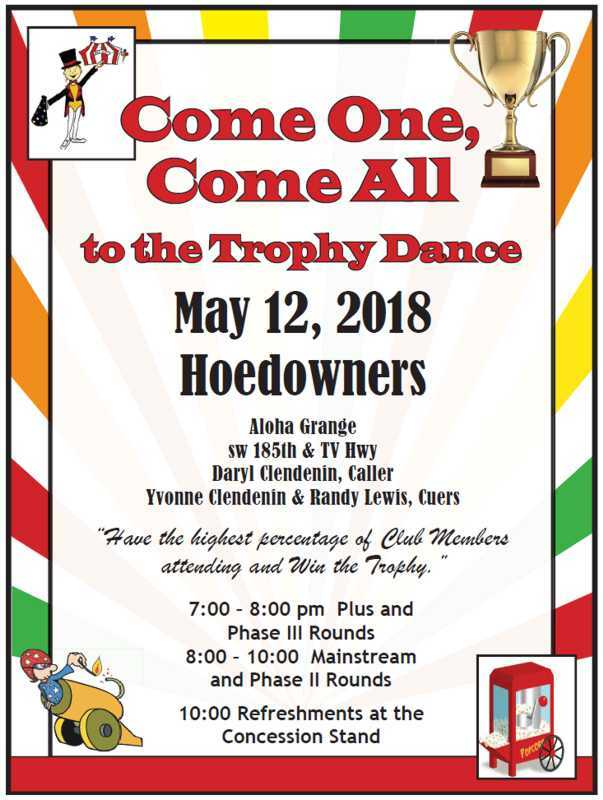 The Hayshakers are having their Anniversary Dance on Friday, May 18th, from 7:00 to 9:00. 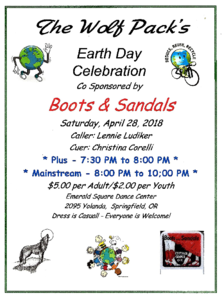 Refreshments will be served after the dance. We are hoping that many square dancers will come help us celebrate. 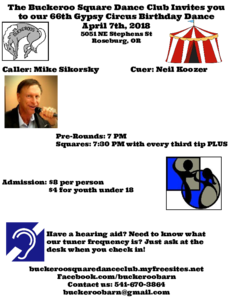 The caller will be Craig Abercrombie, the cuer, Lonnie Sycks. It should be a fun evening. Let us know if you can make it. Call Kathy Worthington, 503.861.2726 or Sylvia Davis, 503.325.8109. They say February is the border between winter and spring but this year it’s when winter arrived. Hoedowners can’t complain because it seems that February flew by and we were oh so busy! We began the month on the first with a casual evening out at Pizzario in Hillsboro to enjoy wood fired pizza and listen to new members Earl and Mosu perform. What a wonderful, spontaneous evening. February 10th was our Queen of Hearts Dance and on the following Saturday, February 17th, twenty Hoedowners attended a visitation at Sunset Promenaders. We had a spectacular time and enjoyed our first opportunity to wear our new club outfits on a visitation. Those hats are starting to show up everywhere. We celebrated the Hoedowner 68th Anniversary Dance on the 24th with our traditional chicken dinner. We added mac and cheese to the menu and it was gone by evening’s end. We love seeing the Aloha Grange dining room filled to over flowing. We counted 105 for dinner and a total attendance of 116. Big thanks to the four clubs who held visitations; Valley Squares, Sunset Promenaders, Eager Beavers and Toe Draggers and to all the guest callers and cuers; Darrell Kalmbach, Mike and Julie Stout, Mark Wheeler, Janienne Alexander and Connie Clark. Back by popular demand we scheduled a Hoedowner Paint Nite on February 26th. We met early for dinner then laughed our way through two hours of learning to paint “Fairy Lites”. I hope you have a chance to see the display. 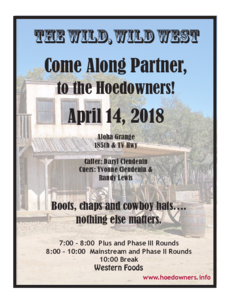 In April we’ll break out the boots and spurs for our Wild, Wild West Dance on the 14th. Everyone will be gussied up in their best and rarin’ to whoop it up. How about you? 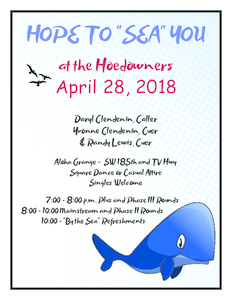 April 28th will be more sedate for our Hope to “Sea” you Dance. Whether you like your salt water crashing on the rocks or lapping at the shore, Hoedowners will be ready to greet you at the door. Last month's article left us with the cliffhanger of how Randy's DBD plus lessons would go. This month we are happy to share that they are going extremely well, with three to four squares showing up every week. Many stay for the dance. Some are long time friends, while others are newer friends. We welcome them all. At our most recent M 'n M dance a good turnout of Valley River Dancers allowed them to take our banner again. We had a great time visiting them to retrieve our banner and anticipate visiting them again soon. Toe Draggers' hospitality provided us with another delightful evening as we retrieved our banner from them. We were greeted by friends we hadn't seen for a while and made new friends. Luckily, February's snow didn't disrupt our dance schedule, and spring is underway. So many clubs have members that travel in the winter we are thankful to have such positive support from so many. We had 6, maybe more, clubs represented at our Valentine's dance on February 9th. 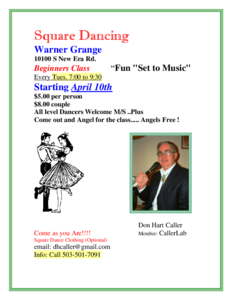 Come celebrate with us on April 13th for our 65th Anniversary dance. Plus and advanced rounds from 7-8, then Mainstream with rounds 8-10. Happy 65th Anniversary R Square D!! On April 28th we are DARK. Please support Yakima Spring Sashay or Salty Sashayers. For more information about us please visit our website at www.r-square-d.info or friend us on Facebook. Our caller for R Square D is Craig Abercrombie and our cuer is Lonnie Sycks. The Sunset Promenaders Club is busy with lesson schedule each Sunday Mainstream Square Dance from 4 to 6 with Mike Stout and Julie instructing. The lessons are coming along well and these students and number are encouraging for the Club to build up our club member numbers with good and a little younger dancers. We had a B-51 Jamboree on the 18th of March and it was fun. • April 7th our Club is DARK so we can go visit the Valley Squares in Aloha on their Anniversary. 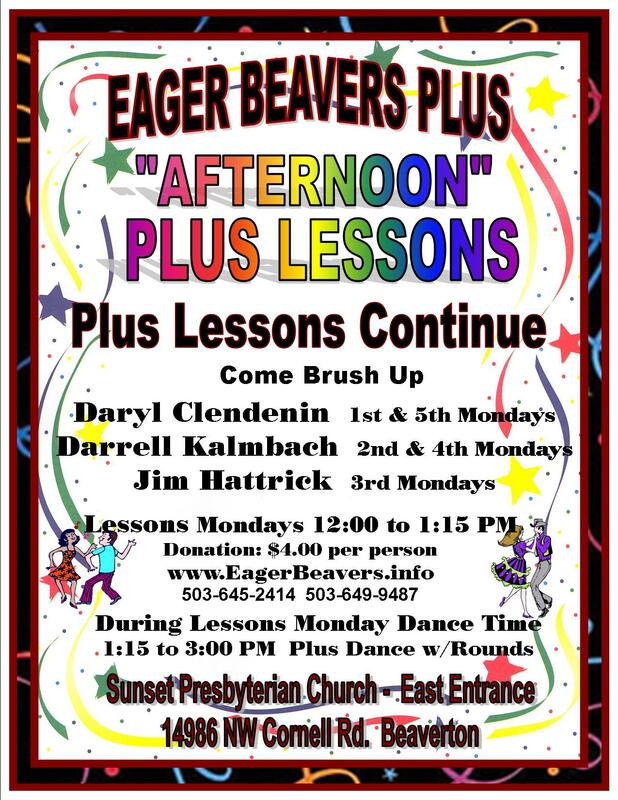 • Thursday April 5th and 19th is our Plus Dances, with Darrell and Ken. 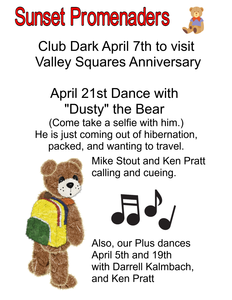 • Our Saturday April 21st dance theme is traveling bear dance. This is a Mainstream dance and comes with an invitation to all dancers to come meet “Teddy”, have your picture take with him, and some lucky club will be able to take him home so they can have a bear dance soon too. Teddy is friendly and he likes to travel. 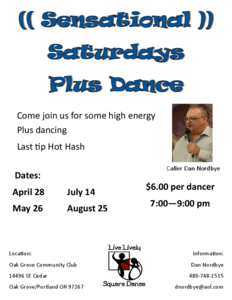 • Our schedule for each dance is Round dance at 7:00, Square Dance starts at 7:30 until 9:30. Additional parking is available at the bank across the street. The Location is IOOF Hall (upstairs) at 267 E. Main St. in Hillsboro. 503-805-5867 for information.. So, enjoying the Spring flowers popping up all over. We are looking forward to a busy time ahead of us. 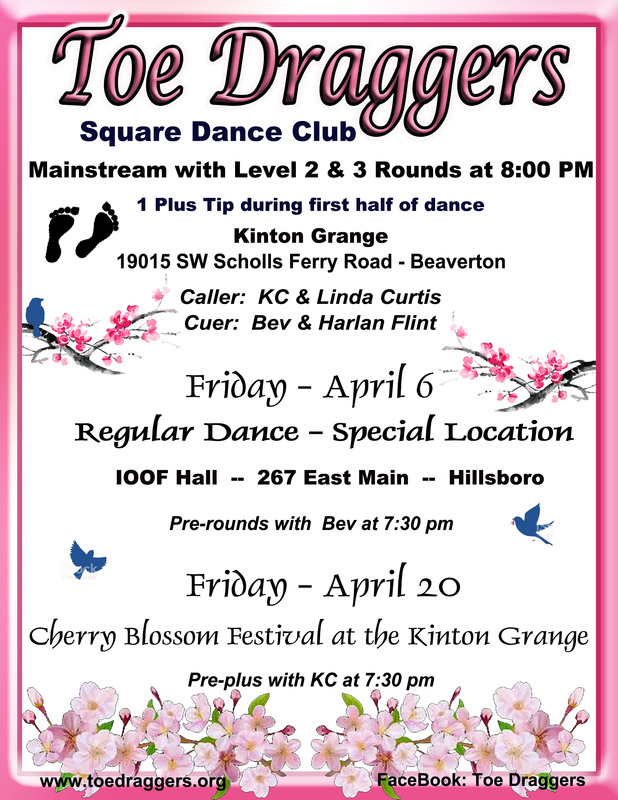 Hope you join us for our March 16th Shamrock Sashay at the Kinton Grange, but do remember our first dance in April on the 6th will be held at the ODD Fellows Hall in Hillsboro. 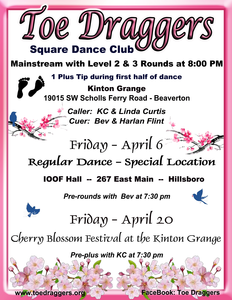 We will be back to the Kinton Grange on April 20th for Cherry Blossom Festival. We have been out visiting other clubs these last few months and having a great time. We are looking forward to our Mystery Trip in May, Progressive Dinner and Kinton Grange Rummage Sale in June, Summer Festival, and our club campout in Aug. There is lots of planning ahead to keep us busy and fun activities to look forward to with the Toe Draggers Club. We do have a good time together. 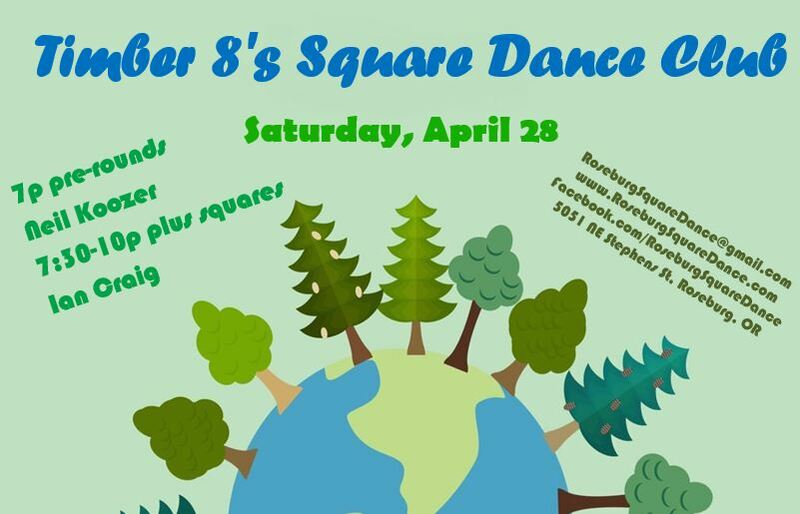 Hope to see you in a square. Tri Squares had a terrific Mardi Gras Masquerade Ball in February. We gave away over $1,000 in raffles and door prizes! In March we finished up our Mainstream lessons. And in April we're looking forward to our annual general meeting dinner with elections for next year's officers. 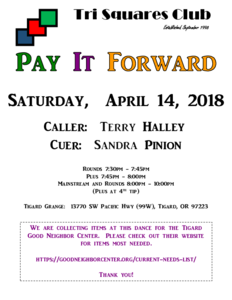 Come join us for a dance - Saturday, April 14th is "Pay It Forward" when we bring donations for the Good Neighbor Center in Tigard, and Friday, April 27th is "Hippie Hoedown" when costumes are really fun. Our 69th Anniversary Party kicks off the month of April. 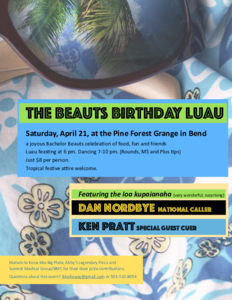 Please help us celebrate at Aloha Grange April 7th. Scott Zinser is calling and Connie Clark cueing. 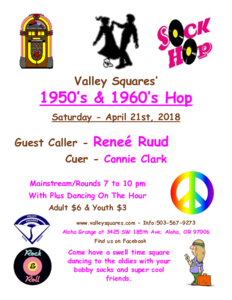 Dig out your outfits from the 50’s and 60’s and join us for our Sock Hop April 21st. 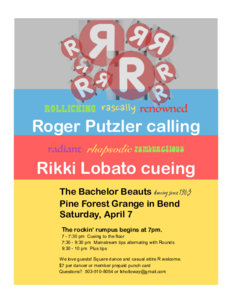 Renee Ruud is calling & Connie Clark cueing. When I think of those days I picture guys lined up in front of the bleachers while we girls waited for them to gather courage to ask us to dance. One of my students wrote about her fifth grade square dance class where the boys stood, hands behind their backs, “as if they had suction cups attaching them to the wall.” So apt! Our Souper Bowl Dance had yummy soups, mostly of the vegetarian variety. We had a fun contingent from Tri-Squares as well as other guests. Colorful beads added to the atmosphere for our Mardi Gras Dance. Our lessons have been great fun. Craig Abercrombie gets the students dancing right away. We have between 12 - 17 students, depending on how many make the trek from Tillamook. We ended the month with a visitation to Hoedowners 68th Birthday Dance. 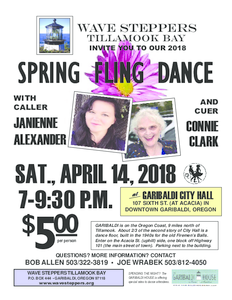 The club’s April 14th dance will feature caller Janienne Alexander and cuer Connie Clark in Garibaldi. Garibaldi is nine miles north of Tillamook on US 101. City Hall has a huge second-floor dance hall built for the old Firemen’s Balls. The club has had square dances there since the building was built in 1948. 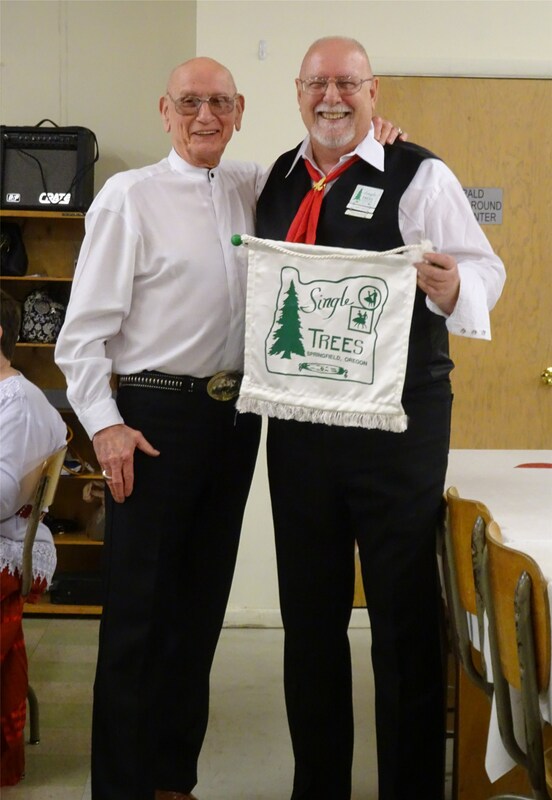 The Wednesday night square dance classes resumed on January 4th at the downtown Tillamook Elks Lodge. These lessons are FREE and are taught by Joe Wrabek from 6 to 8pm. Dancing & instructions in known rythms. 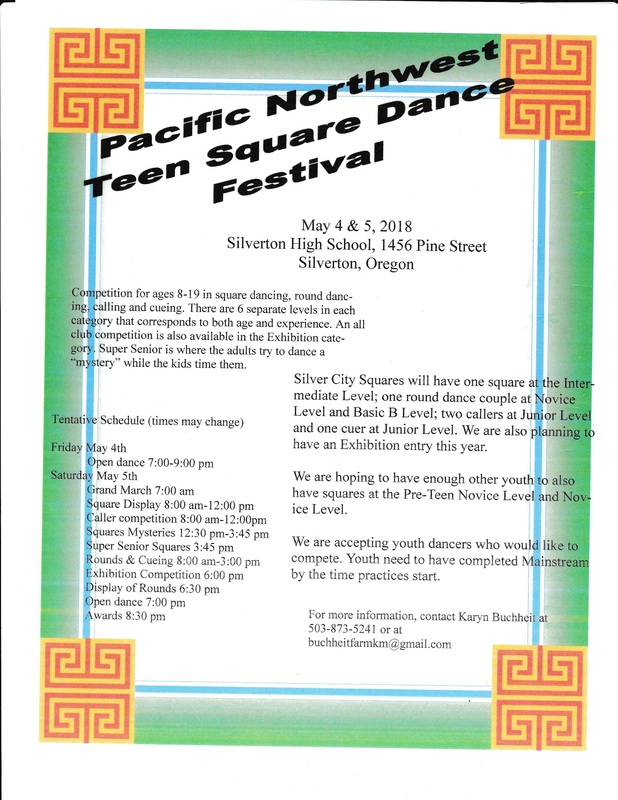 Copyright © 2018, Oregon Federation of Square and Round Dance Clubs.